I know I haven't really got time for this BUT.... I had bits left from my CCC earlier in the week and I just wanted to use them up and I saw the red, black, white and yellow challenge at Just Us Girls which fitted perfectly with the alcohol ink splatter pieces I have got. I also found this great sketch at Create 4 Fun - I will definitely be using the splatter technique again (it reminded me of when I used to make a similar pattern with paint and straws when I was teaching eight and nine year olds) -................. so here is my card. 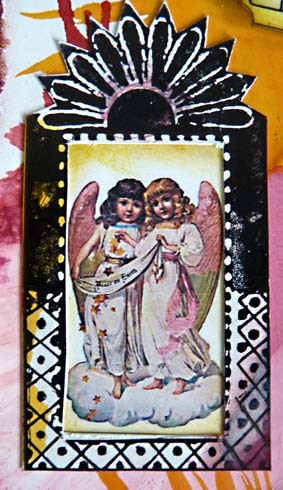 The image of the angels is another from a Gaby Braun collage sheet and the frame is stamped from Invoke Funky Frames set. The ticket is from Stitchy Bear digi stamps. 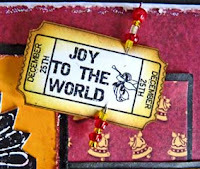 The coloured papers are a very old set of Christmas Brights from HOTP and the black and white is from an un-named stack pack. The only other bits are a pin and beads and star dust stickles. Other challenges to have fun with. A beautiful card Brenda. Hope you are well. Thank you for visitting me too! This layout is very pretty and it looks like you had fun creating it!! Thanks for Distressing with us over at Frosted Designs!! Lovely card! 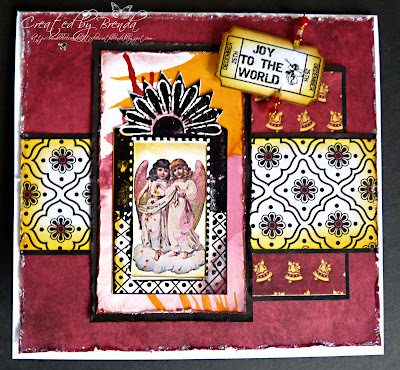 Love the angels and you background technique! So glad our JUGs colors were the perfect fit! Thanks for playing our challenge! Hooray-- two Brenda masterpieces in one week! This entry is every bit as wonderful as your first, and I love the little angel image you used. SO sweet! Your colors are gorgeous, too, and is there a better holiday shade than cranberry? I don't think there is! Bravo, times two! 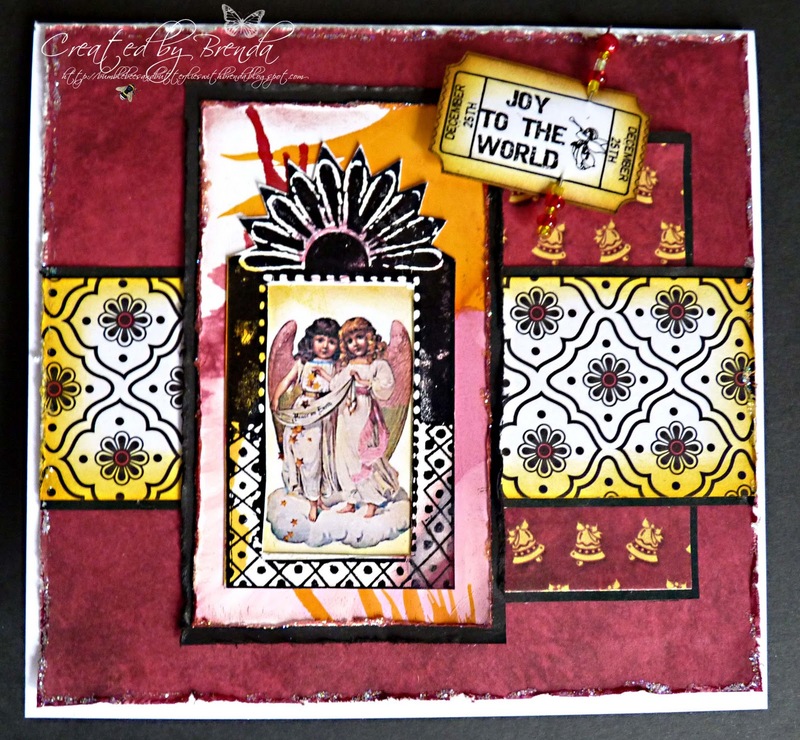 Gorgeous warm tones and beautiful detailing, Brenda! Lovely card! Hope you and yours are doing well! 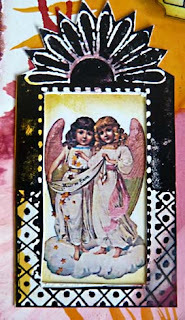 These little vintage angels are adorable! Beautiful card Brenda the design, colours and image look gorgeous I love it. Beautiful card - nicely done. Thanks for coloring with JUGS this week.